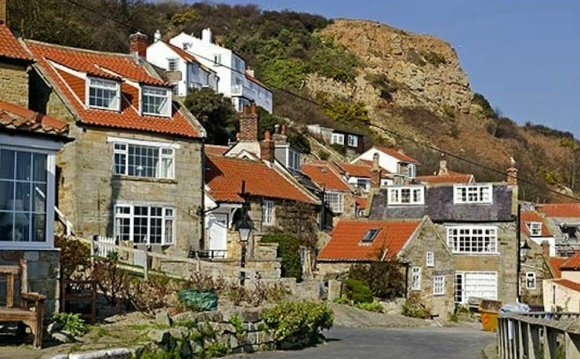 Some eight miles north of Whitby, the pictureque village of Runswick Bay clings to the cliffs at the end of a long sandy beach. At the end of the steep descent from Hinderwell village, you have to leave cars in the car park and explore the village on foot. Many cottages have been lost to the sea over the centuries. Though the village is now protected by a sea-wall, the rate of erosion can be judged from the row of beach huts on the cliff to the south of the village. This is the last of five such rows that stood on the site years ago. In order to increase the family income, the fisherfolk would live in such huts during the summer months while letting their cottages to the artists and holiday-makers who flocked to the village after the railway was built. One benefit of the continued erosion of the cliffs is the constantly refreshed supply of fossils. Ammonites abound, locked into small ironstone pebbles scattered along the beach. The fossil remains of a Plesiosaurus and an Ichthyosaurus were found here a century ago and are now in Whitby Museum. The local lifeboat is still actively supported and has a brave history. On one occasion, the womenfolk of the village launched and crewed the boat, to rescue their menfolk who had been caught offshore in a freak squall. NB: The Esk Valley Railway does NOT serve Runswick Bay. There used to be two rail lines from Whitby to Middlesbrough. The one through the Esk Valley is still running. The one that ran along the coast via Runswick and Staithes was closed because of cliff slippages.